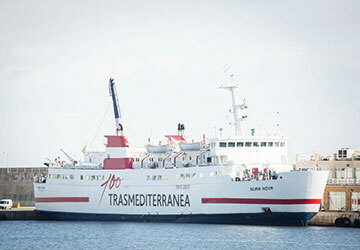 Nura Nova is a recent addition to the Trasmediterranea fleet and can carry up to 377 passengers and 86 vehicles. On board you’ll find plenty of services such as comfortable seating and multipurpose lounges, a fully stocked restaurant, a cafeteria, snack dispensing machines, pet kennels, a sun deck, medical services and a play room for younger travellers. Due to the short duration of the crossing, there is no cabin accommodation on offer. But that doesn’t mean you won’t be able to relax whilst making your trip as reserved seating are arranged in rows of 2. The seats recline and the area has windows which allow you to take in the breath taking views. You can grab a bite to eat at the ship’s cafeteria where you’ll find a selection of soft drinks, alcoholic drinks, hot and cold snacks as well as ice creams. There is also a restaurant with a wide array of food and beverage options. If you are on the move around the ship you’ll find dispenser machines for snacks and sweets that are available at any time. You don’t have to be stuck inside during your voyage, the sun deck means you can enjoy a stroll with crystalline sea views or even top up your tan with a lie down on the sun loungers. Children are well catered for onboard the Nura Nova and can pass the time on board with a trip to the ship’s play room, which features soft toys and children sized furniture. Please Note: Whilst we have taken great care in making our Nura Nova guide as accurate as possible, onboard facilities, services and entertainment may vary depending on the date and time of year that you travel, facilities mentioned may change without notification and ferry companies reserve the right to operate vessels other than those mentioned at time of booking without prior notification.